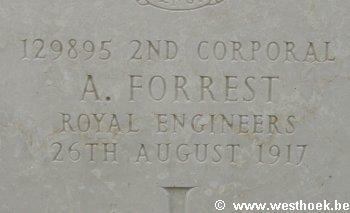 2nd Corporal A FORREST 129895 "P" Special Coy., Royal Engineers who died on Sunday 26 August 1917. 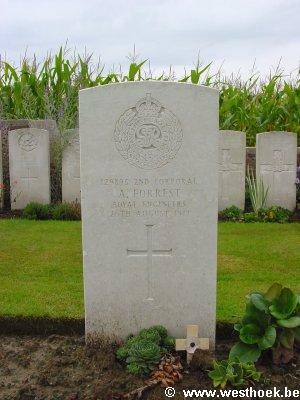 Lance-Corporal Archie Forrest, age 20, Royal Engineers, served in 'P' Gas Company, that was working from Poperinge and went up by night to carry its terrible gascylinders into position beyond the front line. He was hit by machinegunfire a little past midnight at St.-Jan, on his way back to safety, and died of his wounds the same day. He is buried at Wieltje Farm Cemetery. The boy left a very deep impression on Tubby Clayton (Talbot House). A curious oak chair was given to Talbot House by his comrades. It served as a bishop's chair at confirmations. Moreover the back can swing forward to form a table in case of need. Archie was baptized, confirmed and made his first Communion in the Upper Room of Talbot House, all in six short weeks before his death on 26 August 1917. 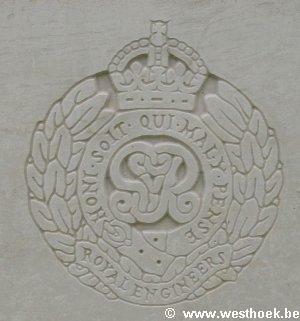 (Info : Brochure 'Talbot House', vzw Talbot House van Poperinge) 2nd Corporal A FORREST 129895 "P" Special Coy., Royal Engineers who died on Sunday 26 August 1917. WIELTJE FARM CEMETERY Grave B. 12.